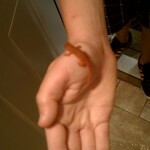 The newt is not mine, nor is the child holding it. The shot is blurry because I had to rush before the newt could jump off his hand and onto my freshly mopped kitchen floor and, perhaps, disappear into my soccer bag in the closet. What are afternoons at your house like? Now, we love ourselves a good typo on a sign, especially on printed signs. Parents probably get enough potty humor at home without getting it at the movies. 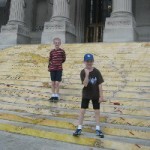 Overall, though, the message of friendship and being yourself is a good one for kids.